This dish is a very quick and easy chicken dish with a simple pan reduction. I used Double White from the Southampton Publick House to make the reduction. The wheat beer and honey pair well together and make the sauce’s consistency more of a glaze. From start to finish this meal takes about 30 minutes to prepare and uses ingredients that are staples in a pantry. If you do not have shallots you can substitute with onions. Give this recipe a shot and as always, Enjoy! Last weekend I was watching a show on The Food Network and saw this recipe. I made a few changes to it and you can find my recipe along with step by step pictures at the end of the post. This recipe takes a bit of time with all the preparation and marinating times but the finished product is well worth the effort. First you need to roast the garlic and make the paste to marinate the chicken. You do this by placing the garlic bulbs in the oven for 30 minutes at 350 F. Then you add all the ingredients into a food processor or blender. You then rub the paste on the chicken and let it marinate for 2-4 hours. When making the couscous you first partially cook the grain then hold it to the side. In a pan you brown the chicken then use the pan to finish cooking the couscous. For the final step you transfer the couscous to an oven safe dish and add the chicken. You then bake covered for 20-25 minutes then uncovered for 20-25 minutes, or until chicken is done. Enjoy! With all the warm weather we have been having recently, and with my cousin’s Jamaica wedding coming up in two weeks I decided to make Jerk Chicken. The recipe is very simple but for best results does require it to marinate overnight. The Jerk rub is quite spicy but not overpoweringly so. You can use boneless chicken breasts or a full chicken depending on what you feel like using. Enjoy! 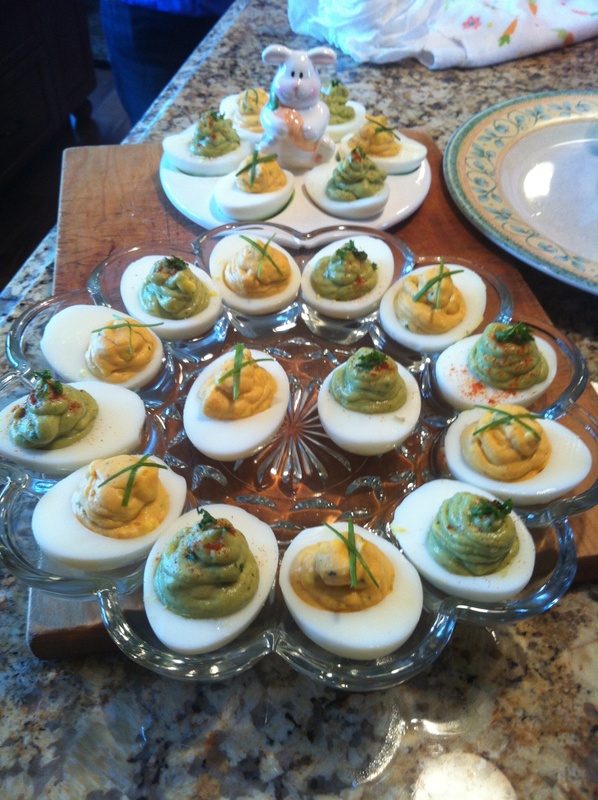 Last weekend I made some deviled eggs for Easter. Instead of making classic deviled eggs I decided to put a twist on this traditional Easter dish. For the first set of deviled eggs I spiced them up with some Siracha hot sauce and garnished them with thinly sliced scallions. These eggs with an Asian twist are a good change up from the classic. The Siracha is not overpowering and gives the eggs a subtle heat. For the second set of deviled eggs I added an avocado into the mix. These eggs were a big hit and gave a nice change of color to the egg plate. You can find the recipes for both below. Enjoy! I wanted to try something special for Easter so I used the techniques I learned last week at the cooking class and made chocolate souffles. These souffles are very rich and go well with red wine, Irish Cream, or a nice stout. You can make the souffle mixture in advance and keep it refrigerated for up to 2 days. The most important part making these souffles is to do all the prep work before you start cooking. Separate egg whites and egg yolks, chop chocolate, and measure out other ingredients. Lightly butter ramekins and coat sides with sugar. By doing all the prep work before hand the process of making the souffles will run smoothly. 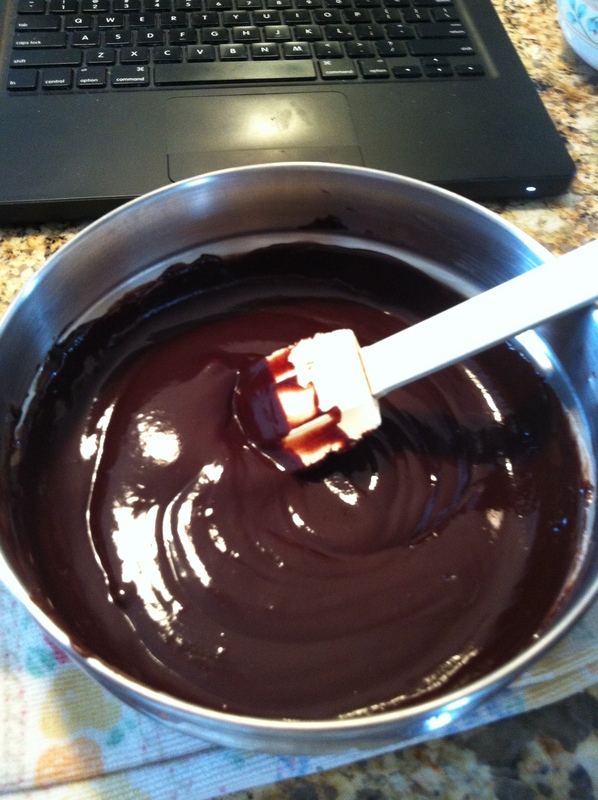 To make the chocolate mixture use a double boiler to avoid burning the chocolate. The mixture should look smooth and creamy. The hardest part of making souffles, both technically and physically is whipping the egg whites. You will stop once firm peaks form. 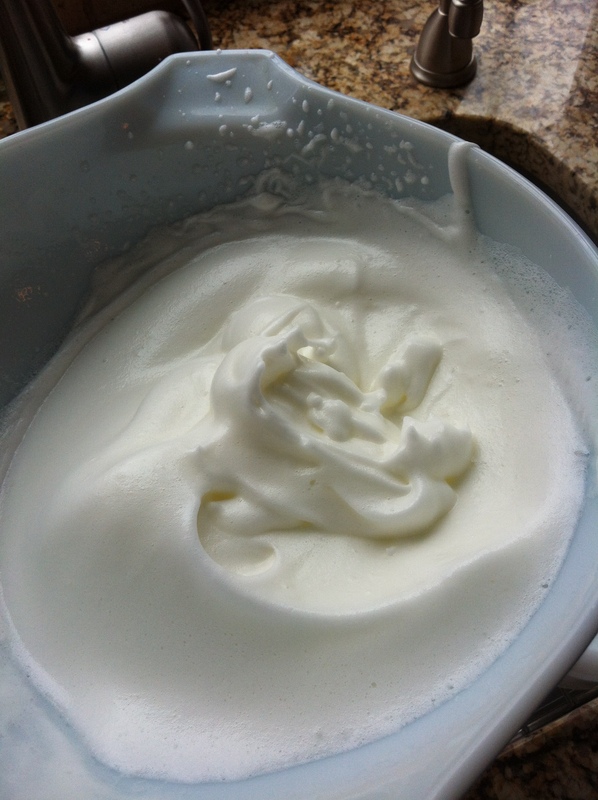 Firm peak is when the egg whites can stand on their own. The most important part of making the souffle mixture is to fold in the egg whites into the chocolate. Do not stir them together, this will prevent the souffle from rising properly. Although this recipe seems intimidating it is not as hard as it sounds. Everyone will be impressed by both the final presentation and taste of this dessert. Enjoy!